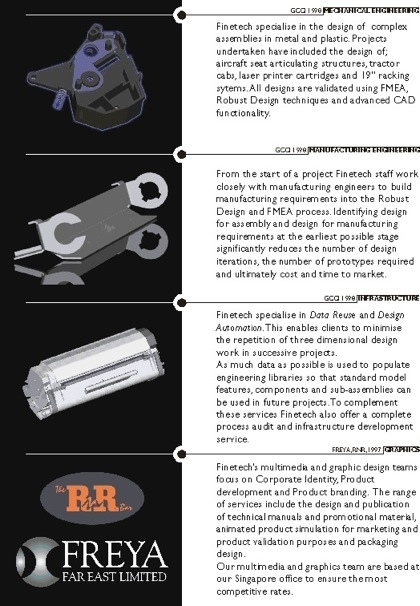 Finetech design was established in 1999 in the Hatfield in the UK. The company took its name from the precision engineering company who kindly provided the office space in return for engineering services. Finetech started life as the sole provider of reverse engineering and design engineering services to Gatehill International in China. Gatehill developed clone laser printer cartridges and Finetech ‘re’ designed these cartridges. The images shown in the brochure show various elements of the cartidges including intricate formed steel components. Also on this sheet of the brochure we made reference to the other services offered, namely graphic design and branding. Freya Far East was an insurance fraud investigation company in Hong Kong and the RnR bar was a bar and night club in New Zealand.